See below for information about registering for tickets via our waitlist/lottery. Kirby has made his career in tourism by being a bit of turnaround guy until recently. Now the GM of the popular new Sea to Sky Gondola in Squamish, BC that has changed into being a ‘turn it up’ guy. 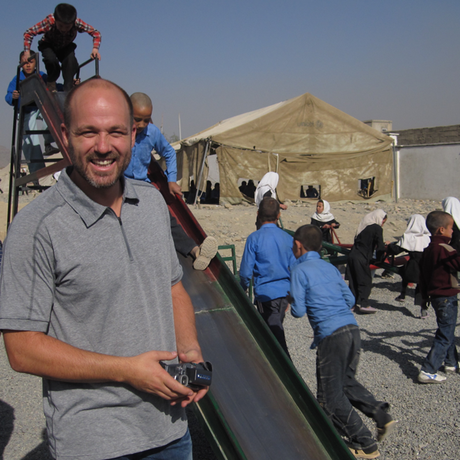 And, for the last 9 years, he and his friend Keith Reynolds have been spending every spare moment bringing play to kids in some of the worlds most chronically conflict ridden areas. Playground Builders is as grassroots as a charity gets. The guys do most of their work at Keiths’ kitchen table in Whistler, BC where they hand write thank you cards and argue over Skype with gravel suppliers in places like Baghdad, Iraq and Kabul, Afghanistan trying to shave cents off the cost of construction. It’s not about being cheap. It’s about spending every single dollar donated on building as many safe areas for kids to play as possible. And they’re just getting ready to ramp it up. How do you define creativity and apply it in your career? I’m an ‘inside the sandbox’ creative guy. I like to have real solid and entrenched boundaries to operate within. They’re my favourite to kick over and see where the sand spills. My career has been defined by solving big messy problems. That often means you can dig around in juicy systemic issues where others fear to tread and then turn the whole model on its head. Where do you find your best creative inspiration? I’ve never lived in a city. I need an enormous backyard to wander around in. Wandering aimlessly is almost always my muse. Following animal tracks, deer trails, and generally stumbling around in the woods never fails to offer something new…and occasionally it’s itchy. What’s the one creative advice or tip you wish you’d known as a young person? Talk it out. All of my best ideas have only been half baked until I’ve spoken the words aloud to someone…anyone. When I was younger I’d stay quiet and then the inspiration would just slip away instead of developing. Who would you like to hear speak at CreativeMornings? Austin Wang - winner of the International Science Fair Award. What has been one of your biggest Aha! moments in life? I got chosen to be the Valedictorian for my little grad class in Lunenburg, NS. I was such a distracted student that I though I was just submitting my final English paper. Turns out my teacher chose it to be read. Now there was only 200 kids in the whole school from grades 6-12 so I figured there would be maybe a couple of hundred folks in the crowd. But no. The Premier of the province showed up along with the Lt. Governor and a whole gymnasium packed to the gills. So when I took the stage, terrified, that proverbial little voice piped up and said, 'either you can humiliate yourself forever or you can be a good public speaker.’ Well there’s no choice in that so I took the mic and ran with it. The Premier said it was one of the best speeches he’d ever heard - which is little praise from a politician - but I realized then that you can create your own reality. I’m still fearful about speaking in front of people but I can don that mask when I need to. What is the one movie or book every creative must see/read? 'Coming Through Slaughter’ by Michael Ondaatje. It’s an atmospheric story of a jazz musician but when I read it I could actually hear the music in the erratic and staccato way he wrote. He transcended genres. Way cool.